Long time no blog friends! Its been a busy 19 months with my son Jaden, but I’m finally back and ready to give you guys some info on fresh new products, colors, styles and cuts. Stay tuned for photos, blogs, coupons and special offers to come every month! But first Id like to introduce to you one of my new favorite miracle conditioning treatments! I’m so excited to share this with you because I know every ones head can benefit from this. 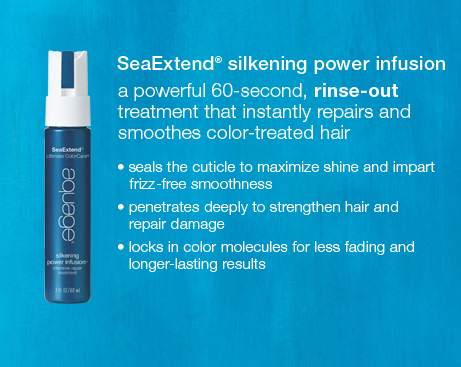 Its by Aquage and its called Silkening Power Infusion treatment. I was introduced to it in October by Aquage at the Fashion Focus hair show. Since then I began to carry at salon at a cost of $22 so you can take home and use once a week, but I also offer a salon treatment for $10. Sometimes we are in such a hurry or in a routine we forget to pay attention to the condition of our hair. Here’s a few reasons how your hair can benefit by using this treatment for just 60 seconds. a powerful 60-second, rinse-out treatment that repairs and silkens color-treated hair. This treatment is simply amazing ladies. It gives the most incredible shine! This conditioner is also a great sealant after a color service to help lock in color! Call today to schedule your appointment.